Billy Happel has a unique story and perhaps laid the groundwork for the incredible enterprise that today sells all sorts of DCI products to an eager public. I was born and raised in LaCrosse, Wis., and was an original member of Blue Stars in 1965, the corps first year as a parade corps. I played French horn in the corps from 1966 through 1969 and took off 1970 at the request of my parents, who wanted me to make money for college. I missed corps so much I rejoined in 1971 and was the corps drum major from then through my ageout year of 1974. I moved to Wausau, Wis., in 1975 to instruct the now-defunct Wausau Story. We took first place at the DCI World Championships in 1976 in what was then known as Class A. I've been on the Blue Stars board of sirectors the last three years and travel with the corps extensively during the summer. Billy Happel and his wife staff the first DCI souvie table at a Drums Along the Rockies show in Glenwood Springs, Colo., in 1975. 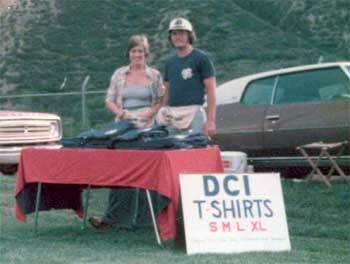 As the 2005 season quickly approaches, I am reminded of my times and travels with DCI in the summer of 1975 selling DCI logo T-shirts. This was the year after I aged out. At the time, I was a sales representative marketing printed sportswear, and so I approached DCI with the idea of selling a shirt at their shows. Initially, I was just looking for a sale, but it turned out to be much more than I ever expected. My first step was to set up a sales meeting with Don Pesceone (DCI executive director at the time) so that I could make my best sales pitch. While Don had many questions, the conversation always seemed to return to his asking, "Do you really think people will buy these?" I assured him that there were a lot of people that would. I could attest to the number of shirts purchased at various venues, as I had amassed over 50 drum corps shirts during my marching years alone. After finally convincing him of the possibilities, he responded by saying that it was a terrific opportunity, but DCI simply did not have the funds to try something like this at the time. Without really thinking of everything involved, I offered to front my own money, purchase the necessary supplies, and handle all the sales at the shows. In return, I would have sole rights to sell a DCI shirt and would receive a percentage of the profits for my efforts. DCI had nothing to lose on this type of arrangement, so with a handshake sealing the deal, the planning was underway. It was decided that we would offer two shirts for the year. The first would be blue with a white DCI logo on the front. The second shirt would be red with a two-colored logo featuring the 1975 World Championships in Philadelphia. The latter would be sold exclusively at during DCI World Championships week. I borrowed a heat transfer machine to imprint the shirts myself. This kept the costs down and ensured that I wouldn't be left with an abundance of shirts at the end of the summer, in case they did not sell as I had hoped. With all of the equipment and materials purchased to get us started, we packed everything into a 1971 Chevy Caprice, a pop-up camper and a rooftop carrier. This arrangement included our luggage, the merchandise, heat transfer machine, one six-foot folding table, lawn chairs,and eventually four adults. The car and camper had to be packed exactly the same way every day so that everything would fit; almost like an equipment truck today. We probably looked like a band of gypsies pulling into show sites, but after getting unpacked, we tried to appear as if we knew what we were doing. All of our sales that summer were done from that small table set up in front of the car where we could access more t-shirts out of the rooftop carrier. With the design, materials and equipment in place, my wife and I hit the road. The summer began with visits through the Midwest weekend shows, and although sales were not brisk, we were selling enough to keep our hopes alive and began planning for the bigger shows and tours. The one factor I neglected to consider was the travel time between shows. When I was marching, it was jump on the bus to the next town, sleep, unload, sleep a little more, and then prepare for the show. Now, I had to drive to the next city, try to get some rest, and arrive at the show site to set up prior to the gates opening. After one weekend of this, I realized we needed reinforcements. I invited my brother and another friend to help us out for the rest of the summer, to assist in driving, setting up, sales and printing the shirts as we followed the drum corps circuit. Our first big tour was Drums Along the Rockies. Now it was time for all of us to quit our regular jobs, as we would need most of the summer off to attend the shows. Our families thought we were crazy, but we were young and really did not have a lot to lose. My wife and brother had not traveled much, so this venture was an extended sightseeing trip for them and just another tour for me. The working arrangement was great! Though I was no longer marching, this experience was just like being in corps again. While the others would man the sales table, I would watch the shows, visit with friends from different corps and market the shirts. Many acquaintances simply bought shirts because I was selling them and probably felt sorry for me, thinking that my life had turned into this -- a drum corps bum selling T-shirts. But we were having fun, the shirts were selling and we were not losing money, so the summer continued. After our tour out West, we headed back home for a rest stop and to reload on supplies. We then headed for the East Coast swing that would culminate in Philadelphia at the DCI World Championships. We were met with unexpected resistance at a few sites that would not allow me to sell DCI shirts at their show, and a few that had exorbitant entry fees that I simply could not afford. These were new and difficult times for DCI and some of the long-running competitions. I was well aware of what was going on in the drum corps community. I had attended the original DCI organizational meetings in Indianapolis when DCI was formed and I had marched as the drum major with the Blue Stars during the Midwest Combine year of 1971. So, I had heard most everything that could be said about DCI, both good and bad, and was not surprised by anything that was said to me. Quite a few conversations took place at the sales table during shows and many times I would have to bite my tongue as not to voice my opinions. It made for a very interesting summer! At last, World Championships week had arrived. I picked up my shirts in Philadelphia from my supplier and started to imprint them for our first day of sales. Just as I had practiced earlier in the summer, I did not print all of them, in case sales were slow. After setting up the table at Franklin Field, I headed back to the hotel to catch a few winks, as I had been up most of the night printing. It was not long and my wife came in the room, proclaiming, "We are all out of shirts!" Back to printing -- this time I continued to print the remaining inventory. We were sold out after the second day, and that included selling the rest of the blue shirts. I contacted my supplier in Philadelphia and purchased another car and trailer full of shirts. I continued to print them as fast as I could, and the hotel room started to look like a T-shirt factory. At times during the next couple of days, we simply had to close the table and wait for more shirts. I was right -- I knew they would sell. I think I ended up buying every red T-shirt available that week in the Philadelphia area (at least every one from my supplier). On the last day when it was too late to get more shirts printed in time, we even sold out of the heat transfers to people who asked for them, along with instructions on how to apply them with a household iron. We were one tired bunch at the end of the week. It was easier to pack the car and trailer for the last time without the T-shirts occupying every available space, and we headed back to Wisconsin. My wife did all of the accounting on the ride home, and we sent DCI a check the following week with a detailed report of the summer. I had visions of what this venture might turn into, but I think DCI was more pleasantly surprised. They started to create their own line of products for sale in the future and took on the distribution themselves. I could not harbor hard feelings toward them, as they were struggling to stay solvent, and any type of moneymaking proposition was of more benefit to them. In the next few years, I was amazed at the growing DCI sales booth at shows, and was proud of what I had started. As the years progressed and the computer age came upon us, it is more evident to me every day that DCI has, in a relatively short existence, created a product that people want to be associated with, and the fans do that by purchasing their promotional items. And now, 30 years later, every time I walk past the DCI tent during World Championships week, I think back to when it all started, with a 1971 Chevy pop-up camper and one six-foot folding table.